These marketing campaigns just keep getting more and more ambitious. This afternoon, Cut Copy announced the release of a new song called “Free Your Mind”, presumably taken from their much-anticipated fourth studio album. The only catch? You have to be at one of six locations around the world in order to hear it. 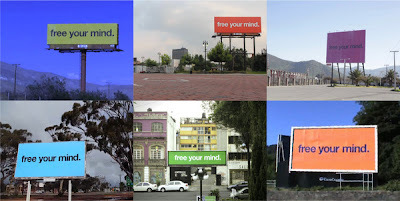 The band has installed “Free Your Mind” billboards in Mexico City, Chile, Australia, the UK, Detroit, and the California desert. Upon traveling to one of these locations, you’re advised to open the band’s website on your iPhone or Android, and make sure both Location Services and audio are turned on. You should then be able to hear the song; I myself cannot confirm this actually works because I’m in Chicago and have no desire to travel to Detroit today… or ever. So someone let us know.